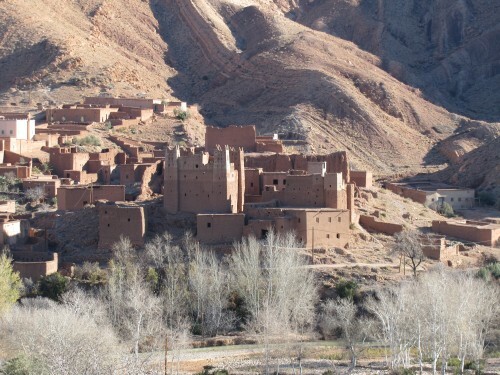 Over recent posts, I have been describing our experiences in the Dades Valley of Morocco. During our two-night stay in the Hotel du Vieux Chateau du Dades I never found out what the structure shown in the photo above was meant to be, or why it was there – apart from being advertising for the hotel where we stayed, which was across the road. 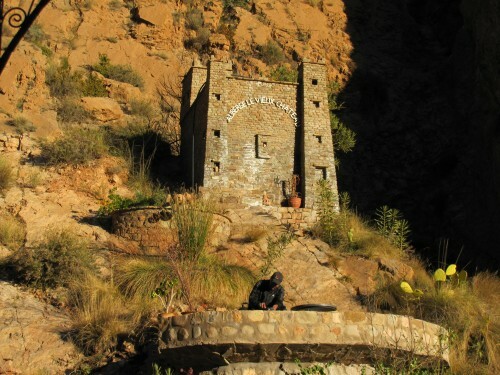 It was similar to several other buildings nearby, so it could well have been simply an example of the typical local architecture. The builders obviously used the common building material available at this location. Further down the valley, the predominant building material was mud, as seen in the last few photos below. 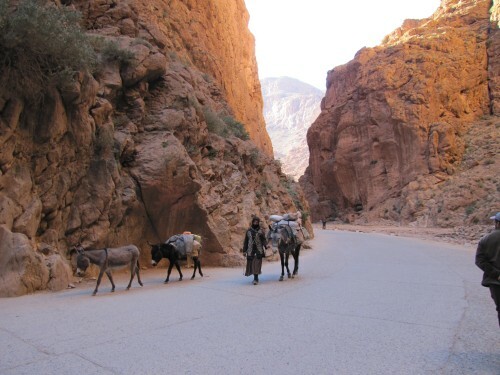 Our tour guide, Said, promised us a Berber omelette for breakfast. He came good on this promise. On the downside, however, he reported at breakfast time that he had been up very early that morning scouring the neighbourhood for enough fresh eggs to make omelettes for the whole group. I am pleased that he went to the effort because the result was delicious. They were actually cooked in tagines and I can still remember the taste sensation. Mine was followed by indulging in a delicious pancake. 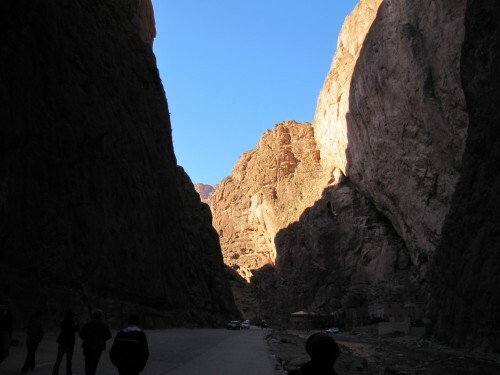 After breakfast, we packed the bus and headed off down the Dades Valley road towards the Road of the Thousand Kasbahs and the Rose Valley. Along this stretch of road, I took the photos shown today mostly from the bus window though we did stop several times at lookouts along the way. 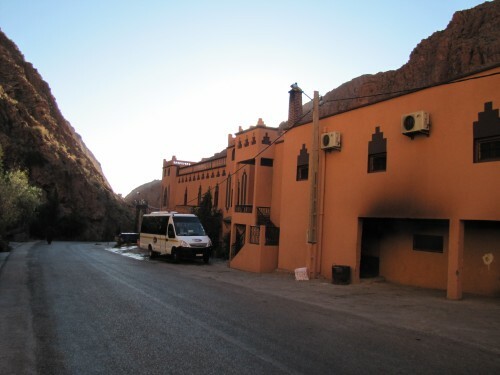 Our hotel in the Dades Valley. Our tour bus is also in the photo. 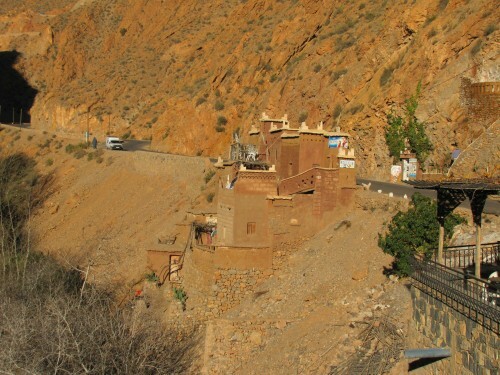 A scene along the Dades Valley road. 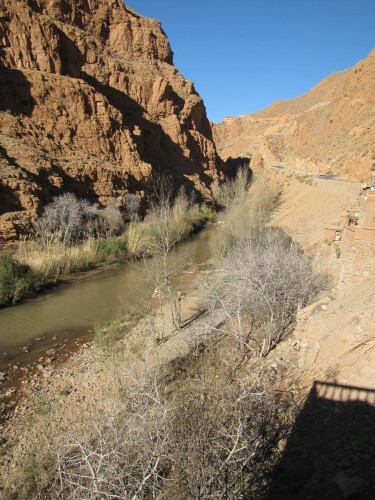 After our visit to the carpet and rug shop in Tinghir in Morocco, we headed off in our tour bus to our accommodation in the Dades Gorge for the next two nights. We stayed in the Hotel du Vieux Chateau du Dades. On our arrival we settled into our rooms, showered and changed for dinner. 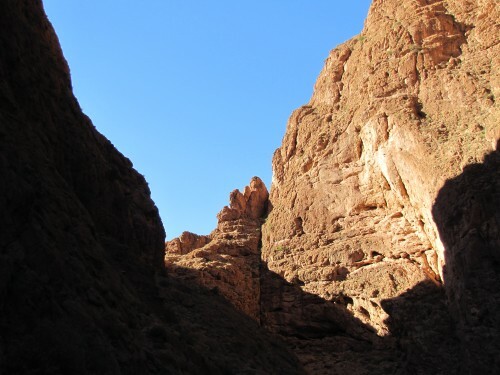 Before that, we had been in our clothes for about 36 hours, sleeping in them in the Sahara the previous night. For dinner, we enjoyed a delightful couscous. One of the major highlights of travelling in Morocco was experiencing their foods. We were never disappointed. We slept reasonably well despite having to run the air-conditioner all night just to keep warm. 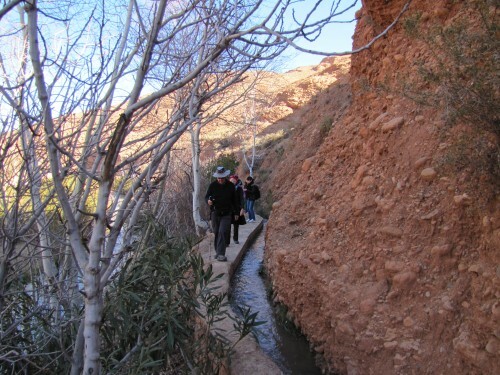 After a wonderful breakfast, we set off walking down the Dades Gorge. 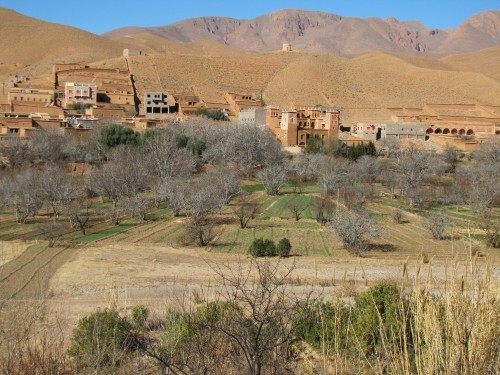 This hike took us through several Berber villages along the way, though we did not see many people. I found that the walk was very interesting but I was disappointed not to see and photograph many birds. 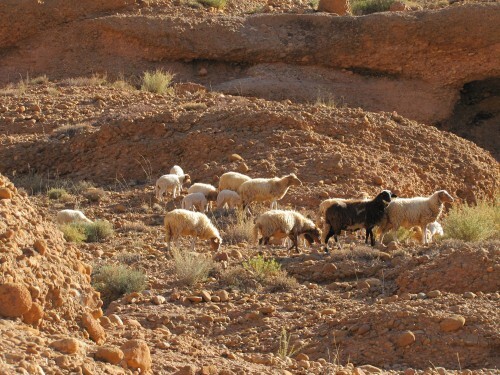 Along the way, we came across a shepherd watching over his sheep and goats on the hillside (see the photo below). A shepherd was watching over his sheep and goats as they grazed. 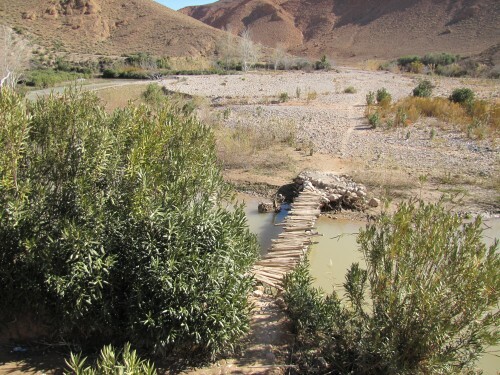 At the end of our trek we had one final challenge: a very unstable and rickety bridge over the river. I have included a photo below, taken AFTER I had successfully crossed over. 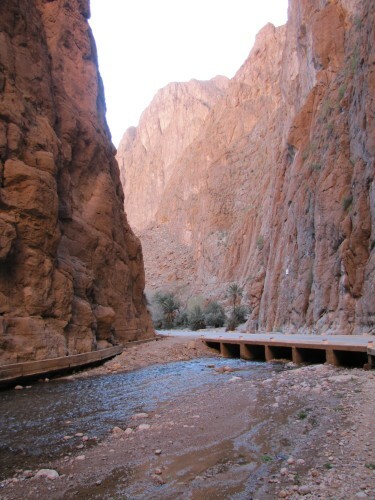 We actually had a choice: cross on this bridge – or walk back up the valley for another four hours to our hotel. Not really much of a choice, in the end. As it turned out, by crossing one at a time, we all successfully negotiated the bridge. Locals probably do it every day without thinking. You call that a bridge? 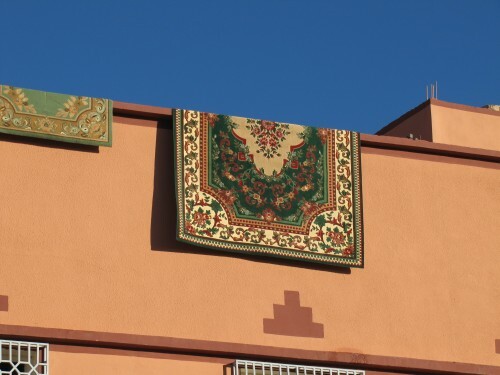 One of the features of Morocco we enjoyed was seeing the many buildings featuring mosaics. They are wonderfully beautiful and alluring to eyes not used to such artistry. Another feature of this magical country were the numerous carpet and rug outlets everywhere we travelled. 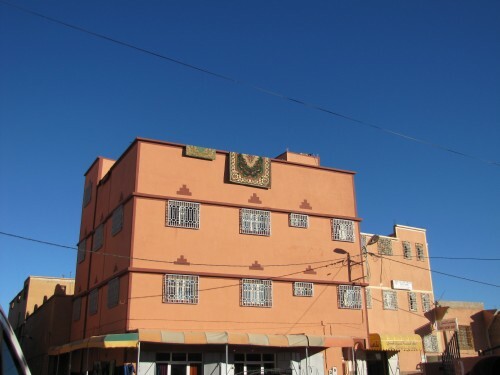 Today I feature one of the Berber carpet shops in the town of Tinghir. 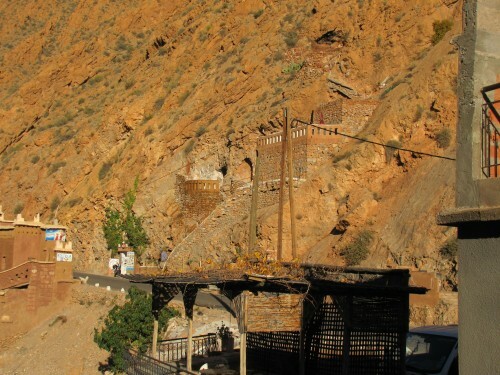 This interesting town has a population of just over 40,000 and is near the Todra Gorge which I featured in my last post. The shop was in the local medina and was a fascinating experience. 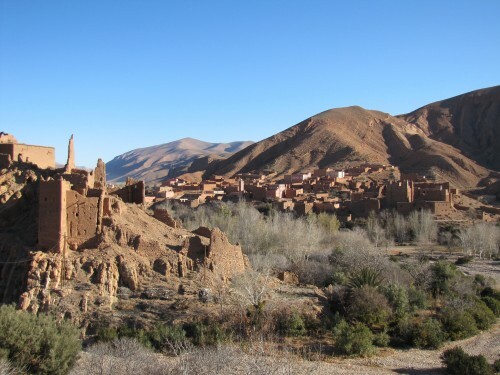 On entering, we were asked to remove our shoes – a common practice in many parts of Morocco – and we were then seated on voluminous cushions on the floor. My old bones and muscles objected to this, but I managed both getting down – and getting up again. As the owner regaled us with the significance of the symbols on the carpets he had for sale, we were served delicious mint tea. 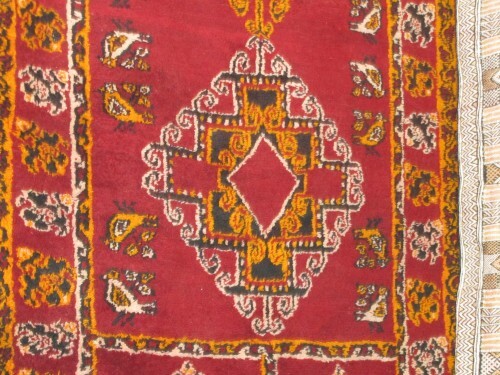 Eventually, four of our touring group purchased small rugs or runners to take back home. I would love to have done the same, but common sense prevailed. They would have made our luggage far too bulky and we were on the upper limit with its weight. Besides, my wife and I decided that there was nowhere in our home where they could be put to good use. The owner actually did a strong sales pitch on my daughter who nearly weakened; she was very tempted, but she resisted. I hope that she doesn’t regret this. While we were in the shop enjoying our mint tea, my wife accepted the challenge to card some wool by hand (see the next photo below). This didn’t surprise me at all. She has had plenty of practice at home over the years. At one stage we had a small flock of sheep, with at least one of them with coloured wool. She enjoyed carding the wool before spinning it. Later she used the wool to knit garments. 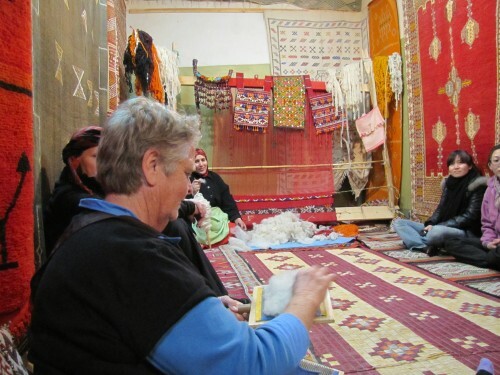 In an earlier post, I featured my wife attempting to spin wool in the traditional manner in Morocco. You can read that post here. My wife attempts to card some wool in the carpet shop.